Creamy dip with just a bit of kick, the cajun shrimp dip is sure to be a hit at your next party! This creamy dip is the stuff snacking dreams are made if. It has just the right amount of spice, plenty of shrimp and gooey melty cheese. It is hard to stop eating it once you start. Make some for your next party or for game day, you won't be disappointed. We happen to love a little spice at our house. Well, two of the three of us do. Little Dude thinks things are too spicy sometimes, but he'll grow into it! I like to have food with a good kick every now and then. I like chopping whole jalapenos for our chili and I love a good stuffed jalapeno. Peach Habanero Jelly? Now that's my jam! I am all about some buffalo chicken dip and have been known to enjoy my hot wings with hot sauce when given the choices of mild, medium or hot. Matt on the other hand, likes to take it to the extreme. He has been known to leave all of the seeds and ribs in some jalapenos with stuffing them. When pops made habanero hot sauce, Matt was the only one brave enough to try it and go back for seconds. When we go to a wing place to watch football he has to order the blazin' sauce. The funny part is, no matter how many times he says he likes it I am not sure I can believe it. His face betrays him every time. A bite or two in he turns bright red. The sweat beads form on his forehead. His eyes well up with tears. "Mmmm these are good" it was his mouth says. "Fire! Fire! Please help me!" is what the rest of his body says. Crazy guy. I guess whatever makes him happy! This dip will not bring tears to your eyes. It is much more likely to bring a smile to your face. There is definitely a Cajun kick, but the sweetness of the shrimp and creaminess of the cheese turns it into a super pleasant warmth rather than a smack your face burn. I made a batch of this for our Easter open house, but wasn't able to get many pictures as I was getting all of the food out for the buffet. It was so darn good though! So I am happy to have the excuse to make it again so soon and share it with you all now! Just the right amount of spice, plenty of shrimp and gooey melty cheese make this so hard to stop eating once you get started. Make some for your next party and you won't be disappointed! It's a great game day appetizer too! roughly chop the shrimp. You want decent sized chunks left so you can see/taste it. so just cut each shrimp into 3-4 pieces. Stir together mayonnaise and cream cheese until mostly smooth. Stir in 1 cup of shredded cheese, green onions, jalapeno, and spices. Spread into serving dish and top with remaining shredded cheese. Bake for 20-25 minutes or until cheese is melty and dip is heated through. If desired, top with a few shakes of hot sauce and chopped chives. Serve with tortilla chips, pita chips or toasted slices of baguette. Tell Matt he better better be ready to up his game. Carolina Reepers from KC's pepper patch will be ready soon. Yikes. I know, that is scary! Matt has an iron gut! A whole habanero! I like your version better. This looks amazing, Carlee! I love shrimp dips! Definitely going into the "to try" file. Thanks, Ellen. I hope you love it! It is so good, I hope you love it! It is definitely enough to make it interesting without making it intolerable! Thank you! This looks amazing! I know my crew would eat it up quickly! Thank you! It always goes quickly when I make it too! Thank you! We had this before our Cinco de Mayo feast and my dad, brother, husband and I almost took out the whole dang bowl. Of course we didn't each much dinner afterwards, but it was worth it! I hope your gang likes it just as much as we do! 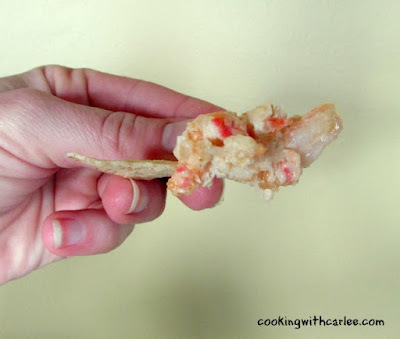 I love shrimp dips! Pinned! I'm not usually one to make dips very often but this looks tasty! I don't make them super often either, mostly because I find them to be addictive! Thank you! The good part is that recipes like this are easy to adjust the heat on. Thanks for stopping by! 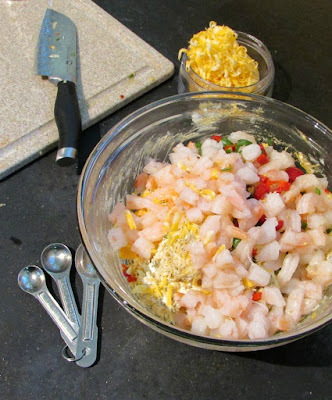 I definitely love some spice myself - and my tolerance seems to be going up as I get older :) Shrimp dip is a favorite and this Cajun version sounds delicious - can't wait to try it! My heat tolerance seems to come and go, but I guess that is part of what makes it fun ;-) I hope you enjoy the dip! I've been needing some new appetizer recipes. This looks great. It's not like anything I've seen before! Pinning! I can assure you it is delicious! I hope you enjoy it, thank you! Oooh, girl, I'm all about this dip! I think it sounds perfect for my next backyard get-together. Thank you so much for linking up your recipe at Inspiration Thursday! I am so excited that it is finally time for outdoor parties again! I hope you love it! Me too, and this one is hearty enough to do the trick too! Bon Apetite! What is it with these crazy guys?! Your dip sounds delicious too, we love poppers and anything seafood. This looks so good. I love hot food! This dip sounds delish! My son Jake is that way with spicy foods. The hotter the better. Most times though, I don't even believe he could be enjoying that! Same with Matt, there's no way he actually likes it when it's making him cry. Maybe it's the endorphins?! I just picked up bunch of baby shrimp, frozen - I just saw it on sale and had no plan for them - NOW I have a plan! Looks tasty, Carlee! So many possibilities, but this is definitely a good one. I hope you love it, Mollie! 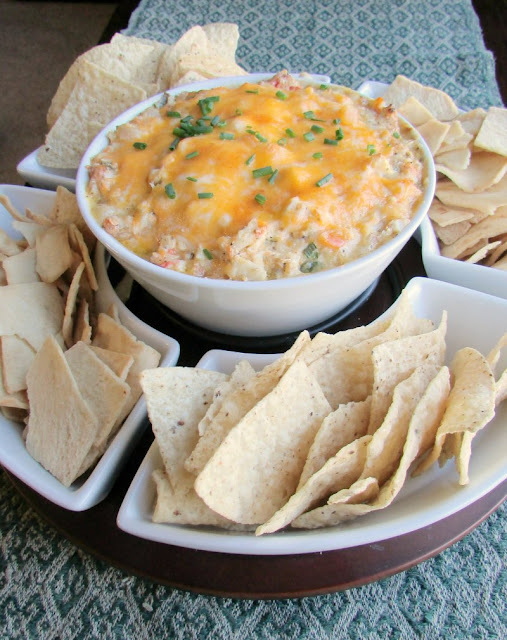 Just stopping by to let you know I made this shrimp dip this weekend and it was a huge hit at the potluck we went to! I'll be featuring this at You Link It, We Make It tomorrow, hope to see you back at the party ;). thanks for the awesome recipe! Yay!! I am so glad everyone liked it!! Thank you so much!